NYPAP is pleased to announce our receipt of Jack Taylor’s papers on the struggle to save Lüchow’s restaurant. This generous and thoughtful donation is valuable both for current activists and for those interested in NYC’s recent history. A former copy editor at Family Circle, Jack Taylor became involved in preservation after transitioning to freelance work and noticing the myriad changes then occurring in his Gramercy-Union Square neighborhood. Beginning in the 1980s, he became one of New York’s most ardent preservation activists. Working with the Union Square Community Coalition, Mr. Taylor also led the Drive to Protect the Ladies’ Mile, an effort which happily resulted in the 1989 designation of the Ladies’ Mile Historic District. 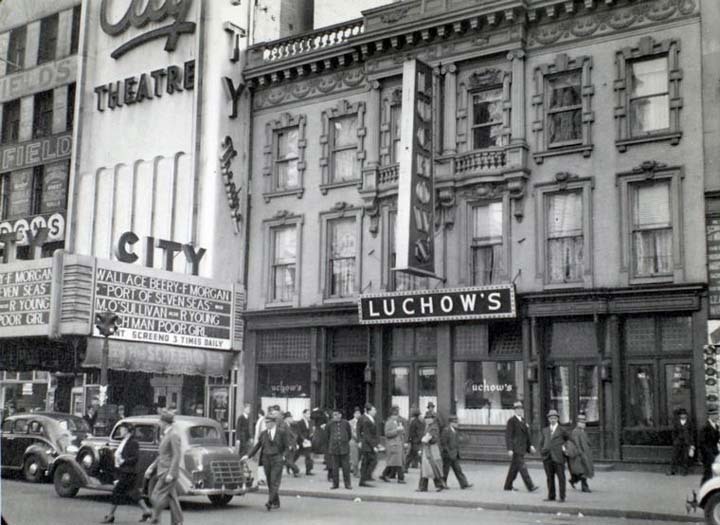 Lüchow’s, the 14th street eatery that once served as a gathering place for the city’s German-American community, was demolished in 1995 after a protracted struggle between preservationists and developers. Built in 1882 by immigrant August Guido Lüchow, the restaurant featured authentic German cuisine and an impressive German Baroque interior. There was also an open beer garden in the back. The restaurant regularly played host to gatherings of the city’s musical community – composers Victor Herbert, Antonín Dvořák, and actress Lillian Russell – were just some of its famous guests – and was the traditional lunch spot for the workers of the nearby Steinway Piano Company. Lüchow’s was also quite popular with neighborhood families, including that of a young Jack Taylor. When new owners moved the restaurant uptown in 1982, the building was abandoned and neglected. A series of ownership changes contributed to the deterioration of the structure, while new zoning regulations made it possible to replace the small restaurant with a larger, more profitable new building. As part of the Union Square Community Coalition, Jack Taylor led the effort to landmark the three-story brownstone, citing the restaurant’s architectural significance and its place in the hearts of many New Yorkers. He recruited famous New Yorkers like Woody Allen and headed a successful letter-writing campaign. Though the Landmarks Preservation Commission held three hearings on the building, they failed to act before it was too late. Unfortunately, in 1994, a mysterious fire destroyed most of what remained of Lüchow’s. The site is now home to a New York University dormitory. The demise of Lüchow’s is one of the greater tragedies in preservation’s recent history, yet its story is instructive for contemporary preservationists. Part of the mission of the New York Preservation Archive Project is to celebrate preservation’s past so that we might learn from it in planning for the future. Mr. Taylor’s gift is thus immensely valuable to contemporary preservationists. NYPAP Intern Melissa Umberger created a detailed finding aid to assist researchers and archivists interested in the Lüchow’s papers. The collection includes dozens of newspaper stories, from feature articles to small blurbs, chronicling the battle over the fate of the building. Numerous photographs of the interior depict the restaurant as it was at the height of its glamour, while unique postcards and menus provide a feel for how it must have felt to visit Lüchow’s. The papers also contain enlightening correspondence between Mr. Taylor and a variety of preservation advocates, revealing the strategies and politics behind the preservation campaign. All of these items are essential viewing for anyone interested in NYC’s recent preservation movement. Mr. Taylor has long been a friend of NYPAP and two oral histories with him are available on the NYPAP website. We are grateful to have him as a still-powerful force in New York’s preservation community.